Delicious food, stunning views. Slightly over the top service, which is way too much for these British tastes! I do not want to be my wait-person's best friend. Very assured touch in the kitchen and interesting menu. Fabulous view and landscaping. Rather cold architectural style, which leaves noise quite noticeable in the main restaurant space which is a very large open area. Could do with some design elements, as very spartan and a bit hangar-like. 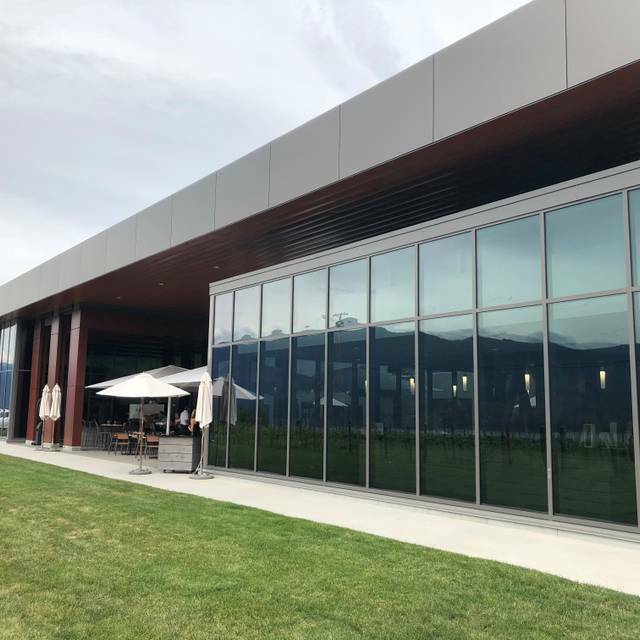 Good idea that the tasting crowds are kept separate from the restaurant - a tip that many other Okanagan wineries could follow. Great venue for a delicious lunch with interesting, well executed food. Was driving so didn't try the wine, sadly, but judging by comments from fellow diners, it was excellent. Beautiful place, good food but OVERPRICED wine in the restaurant and poor service. Does make any sense. The 6 of us loved the whole experience! Highly recommend. 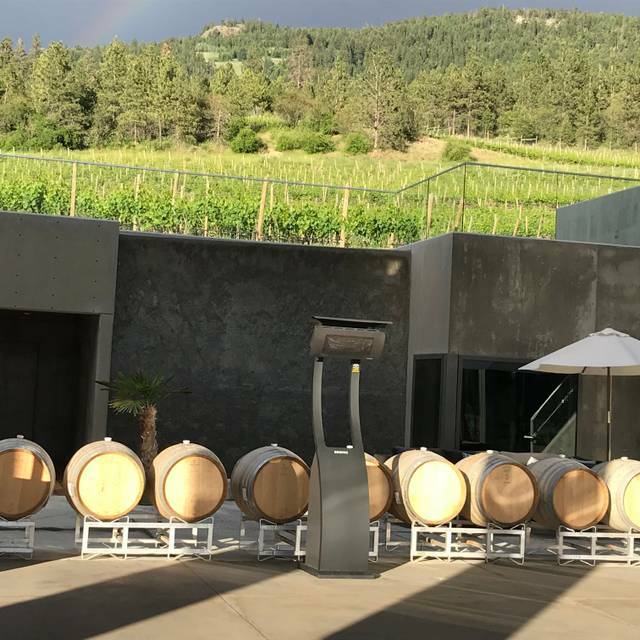 We recently moved to the Okanagan and this was are first visit to 50th Parallel. 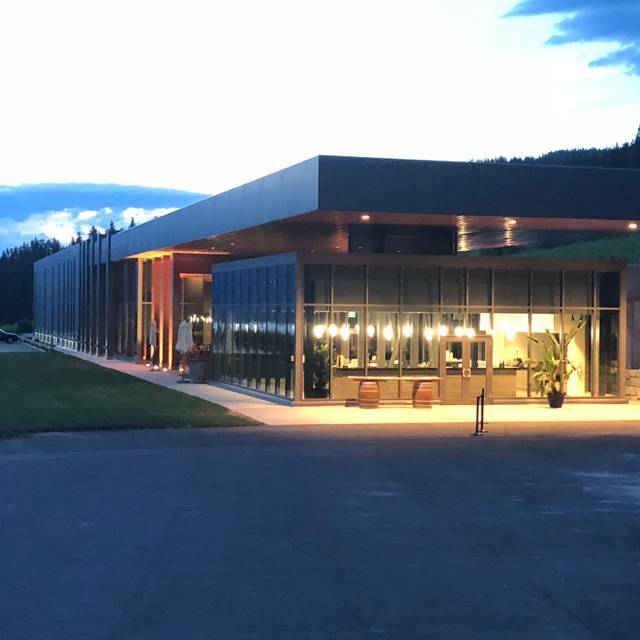 The setting was beautiful and we loved the modern aesthetic of the facility. The service was great with friendly attitude from all of the staff that we interacted with. We never felt rushed and enjoyed a leisurely 3 1/2 hours at the restaurant. Each dish from appetizers to desert was perfect. 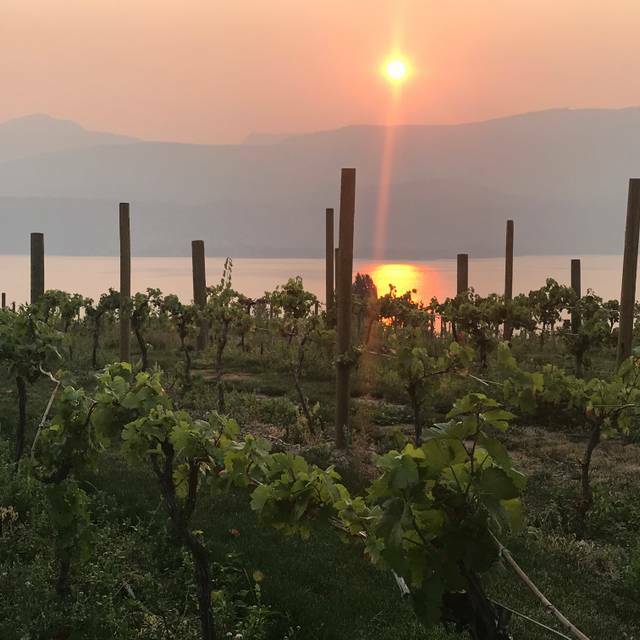 The 2018 Pinot Grigio was fantastic! Too bad there is no longer any available to buy. I guess we will have to come back for dinner again soon! 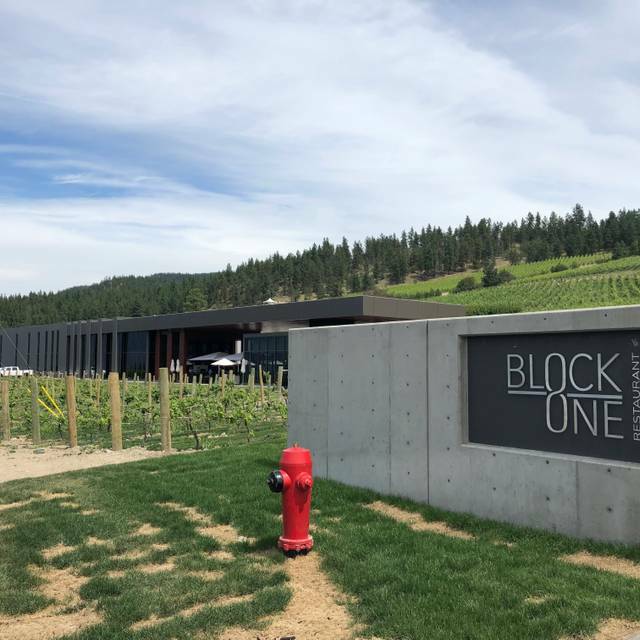 Block One is the perfect location to celebrate a special occasion. The atmosphere is gorgeous, the food is amazing, and the level of service is always spectacular. I treated my sister to birthday brunch and she felt very special being looked after so well on her day. Thank you to James and Mike for another wonderful experience! The building, space, ambiance was spectacular. Really lovely. We felt a bit chilly as we hadn’t brought jackets. The menu was great as was the food. We are keen to return and will recommend it to others. 2. My husband and I shared a 32 oz prime rib. It and the roasted veggies were nice. But the little potato’s were absolutely without flavour and almost had a funny chemical taste to them. We didn’t eat them. Would have preferred roasted with light oil, salt, pepper and butter. Server was great, food was great. Think it is a bit pricey for the portions. Love your Pinot noir but $60 a bottle is expensive for a bottle of wine with lunch. Very tasty brunch, excellent service the the wine served for brunch was good. Would bring friends here anytime! Our party of six enjoyed a fabulous meal and a beautiful Chardonnay ! The view is stunning and the service was fabulous. Wonderful evening celebrating a few birthdays with family. Excellent service and felt very lucky to get a cellar tour as well. We will be back soon! Never fails to impress with each visit. Highly recommend. Food was delicious and the service was outstanding. Mark was our main server and was top notch. Wonderful ambience. The service was impeccable. Made us feel very special. The recommendations from the Host and Server were greatly appreciated. The food choices were amazing. 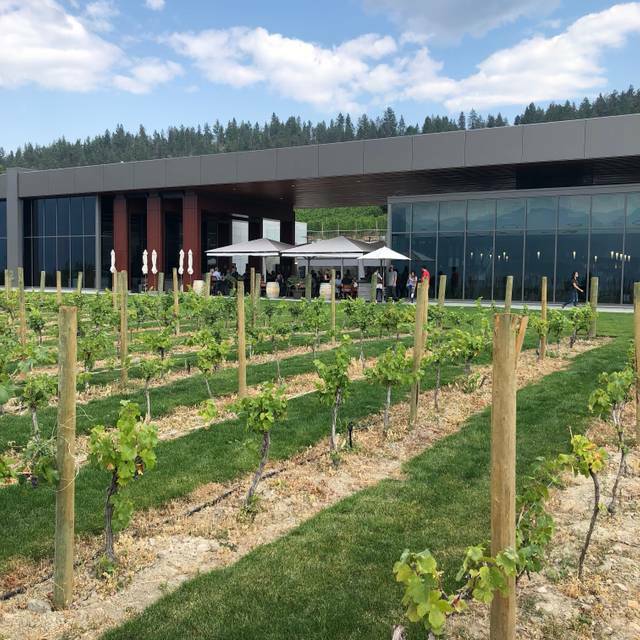 Our first visit to 50th Parallel Winery and the Block One Restaurant. 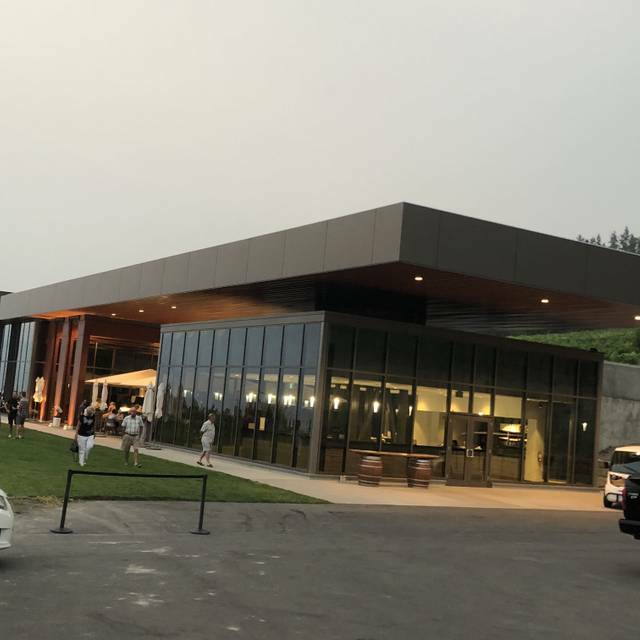 Pleasantly surprised with the modern architecture throughout the tasting area and restaurant. The food was terrific. I had the tenderloin and my partner had the trout. Both outstanding. Service was great, sunset was amazing. All in all one of the best nights we have had at a winery restaurant in a long time. Well done! Thank you, James, for your service in providing for a very enjoyable dinner experience. The food and wine were excellent. We look forward to our next dinner with you. The service was excellent. Our server Mike gave a brief history of the winery and recommended wines and his favourite dishes. We had the crab cakes to start and they were so delicious. It was a beautiful evening and watched the sun set as we began our meal, so romantic. Fantastic staff and food - was such a great experience! Mike our server was very pleasant and knowledgeable. Food was fantastic. Crab cakes and seafood risotto perfect. Burger juicy and flavourful and fries delicious. Chocolate tart for dessert awesome. Beautiful view from our table. Wines were a perfect match for the food. Is was the second time for lunch in two weeks with different people. We all had delicious meals and the service and wine were top knotch! 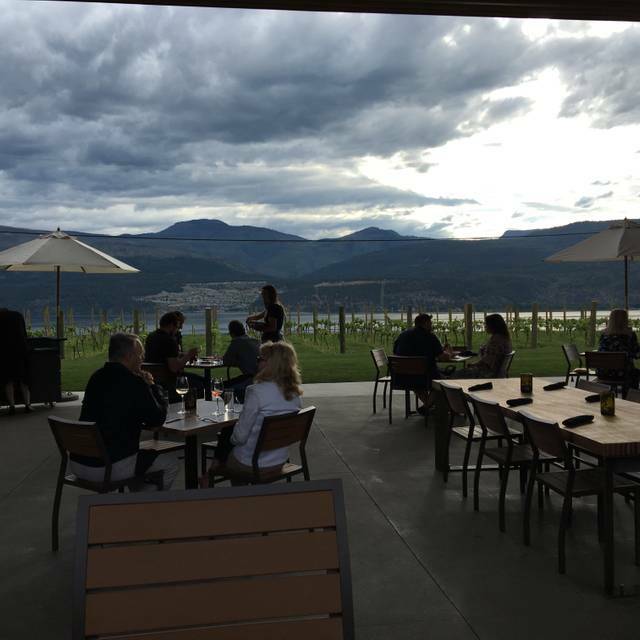 Beautiful location and view that makes this a beautiful place to hang out with friends and enjoy the best of the Okanagan! Food and service excellent. A little on the expensive side - we would come again, but only for a special occasion. Had an awesome afternoon, brunch was delicious our server Mark was the epitome our of professional. The wine was a wonderful compliment to the dishes we all very much enjoyed.. went there because a friend referred us and they were so correct! Will be going back for sure!! A birthday celebration with friends. The food was exceptional. The service was attentive but not overly. The price was on the high side for the venue. I would expect to pay this in the heat of tourist season but not is the slower mid winter. I had the duck special and it was the best duck I've ever had. We also had the beef tartar and we polished the plate. The service and ambiance was exceptional. We will definately be back. 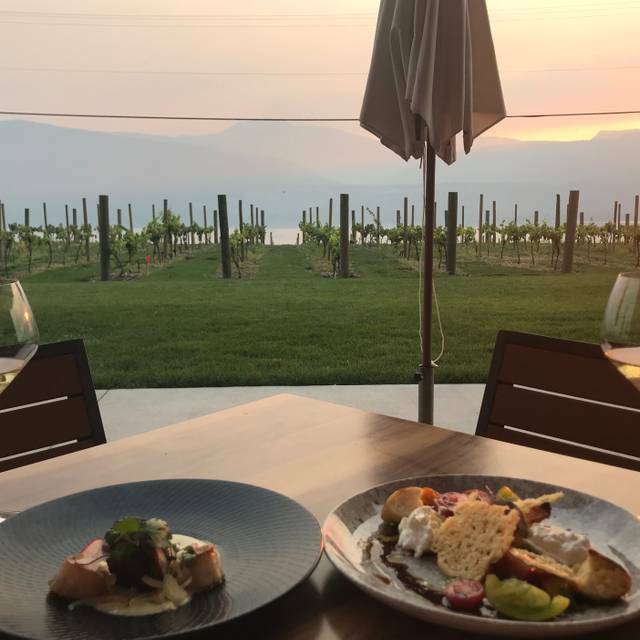 This is our new favourite place when it comes to restaurants in Vernon, Lake Country and Kelowna. The 3 course set dinner on Valentine's was fab. The view, the food, the people make this place a Michelin star worthy restaurant with all the country charm and elegance of fine dining rolled into one fabulous experience. Another amazing dining experience at Block One. Michael and James ensured our meal and wine pairing were spot on. Highly recommend!! We went for Sunday brunch and it was so good! Our server was amazing, she let us take our time as we were in no rush, but was always there when we needed something. The brunch menu is short but we had 4 different items and they were all excellent. Great presentation and flavours. Top it off with a great bottle of Pinot Noir, the great views of the lake and vineyard and it's a perfect Sunday! Highly recommend this winery for food, wine and service. We'll be back. new restaurant just opened in May 2018. Probably some of the best food I have had in the Okanagan. A little bit of a drive and out of the way but well worth it. I would highly recommend anything on the menu and trying this restaurant. You wont be disappointed!!!! This was our third time at Block One, but our first dinner experience. We requested Michael to be our server as he is so knowledgeable, friendly and attentive. The service and support he gives to the wonderful food only make this experience even more spectacular. If we could rate higher than outstanding, we would! Exquisite food! Incredible atmosphere, and the wine. Don't forget the wine! Ambiounce, food and service was great! I wouldn’t recommend for a casual meal but it’s perfect for a date, anniversary, adult setting. Meals were pricey but delicious!! Wife and I went for our 10yr anniversary dinner, excellent food and service. Nice atmosphere, would like to come back in the summer for the outdoor seating area. Server was attentive and knowledgeable. Notified them the reservation was for an anniversary dinner, they made up the table a little extra special and the chef had a surprise appy for us. Perfect holiday menu on right now - 3 courses for $55. Add in wine pairings for an additional $20. Service and food was excellent.